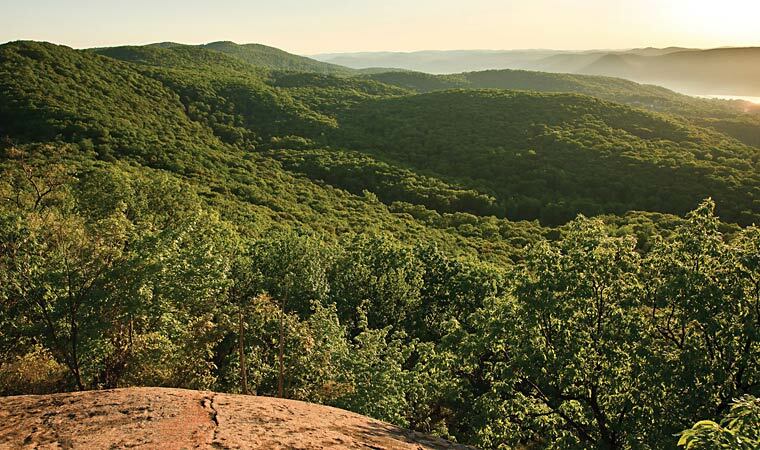 Since launching our Saving the Land That Matters Most campaign in 2007, we've achieved some of the most important land preservation successes in Scenic Hudson's history. Now we're ramping up efforts to conserve must-save landscapes—from breathtaking Hudson Highlands vistas to Columbia County farmland supplying fresh, healthy produce. Every Saving the Land That Matters Most victory improves the quality of our air and water, and furnishes irrepleaceable wildlife habitat. Many provide communities with exciting new opportunities to connect with the Hudson River and other natural treasures in their backyards. And it goes without saying that all are astonishingly beautiful—reason enough to protect them. The downturn in the real estate market gives us a once-in-a-lifetime opportunity to preserve more lands meeting New York State's highest standards for ecological, scenic and agricultural values. We're working in collaboration with 16 fellow land trusts and government agencies to save ridgelines offering iconic views, forests and wetlands critical to maintaining the Hudson Valley's extraordinary biological diversity and farmland essential to creating a sustainable "foodshed" for the region and New York City. But we need your support to get the job done. In June 2018, Scenic Hudson partnered with farmer Cynthia Creech, Columbia Land Conservancy and Equity Trust to protect 120 acres used to breed historic Randall cattle. In November 2017, Scenic Hudson partnered with the Stickle family, Dutchess Land Conservancy and others to protect 73-acre Potts Farm in Red Hook. In September 2017, the Doyle family collaborated with Scenic Hudson and the Columbia Land Conservancy to protect nearly 500 acres of farmland. In July 2017, Scenic Hudson announced the acquisition of 132 acres that protect a significant portion of Ramshorn Marsh. In June 2017, Scenic Hudson and its partners protected a historic farm that is highly visible from the Harlem Valley Rail Trail. In May 2017, Scenic Hudson and the Columbia Land Conservancy announced the permanent protection of 210 acres of productive farmland that help sustain the operations of an iconic dairy. In December 2016, Scenic Hudson and the Agricultural Stewardship Association announced the permanent protection of the 175-acre Laughing Earth Farm in the Town of Brunswick (Rensselaer County). In November 2016, Scenic Hudson conserved 147 acres of scenic and ecologically important land in New Baltimore (Greene County). In September 2016, Scenic Hudson and partners collaborated with the Kiernan and Sullivan families to protect 350 acres at Walt's Dairy. In September 2016, Scenic Hudson partnered with the Greene Land Trust to protect 144 scenic and historic acres along Catskill Creek. In September 2016, a generous landowner donated a conservation easement to Scenic Hudson on 18 acres of farmland in Clermont. In September 2016, Scenic Hudson worked with partners to preserve the 353-acre Camp Addisone Boyce property in Rockland County. In September 2016, Scenic Hudson protected eight ecologically important acres of wetlands in Bethlehem (Albany County). In May 2016, Scenic Hudson protected 22 ecologically important acres adjoining Clermont State Historic Site. In June 2015, John Peckham/Peckham Industries donated a conservation easement protecting 75 acres along a mile-long forested ridgeline that contributes to outstanding vistas. In June 2015, Scenic Hudson and partners added 19 acres to this popular birdwatching destination, enhancing habitat and facilitating safer public access. In June 2015, Scenic Hudson preserved this 23-acre mix of forest and hardwood swamp—a “missing link” in creating an eight-mile hiking/paddling trail along Black Creek. In June 2015, Scenic Hudson and Columbia Land Conservancy acquired a conservation easement enabling owners of this 83-acre, third-generation dairy farm to transition to an all-organic operation. In June 2015, Scenic Hudson protected 376 acres of forest, grassland, wetlands and Hudson Riverfront adjacent to 260 acres of public parkland and prominently visible from Poets’ Walk Park.